Fishing is the activity of hunting for fish. By extension, the term fishing is also applied to hunting for other aquatic animals such as various types of shellfish as well as squid, octopus, turtles, frogs and some edible marine invertebrates. The term fishing is not usually applied to the hunting of aquatic mammals such as whales. Fishing is an ancient and worldwide practice with various techniques and traditions and it has been transformed by modern technological developments. It has even became a sport of some account. Fishermen in the harbour of Kochi, India. Stone Age fishing hook made from bone. "Fishing" is a very ancient practice that dates back at least to the Mesolithic period which began about 10,000 years ago. Archaeological features such as shell middens, discarded fish bones and cave paintings show that sea foods were important for survival and consumed in significant quantities. During this period, most people lived a hunter-gather lifestyle and were, of necessity, constantly on the move. However, where there are early examples of permanent settlements (though not necessarily permanently occupied) such as those at Lepenski Vir, they are almost always associated with fishing as a major source of food. The Neolithic culture and technology spread worldwide between 4,000 and 8,000 years ago. With the new technologies of farming and pottery came basic forms of all the main fishing methods that are still used today. Fishing may even pre-date the development of modern humans. The aquatic ape hypothesis, a controversial proposal, suggests that the ancestors of modern humans went through one or more periods of time living in a semi-aquatic setting and gathered most of their food from shallow coastal or other waters before their descendants returned to a more land-based existence. Fishing scenes are rarely represented in ancient Greek culture, a reflection of the low social status of fishing. There is a wine cup, dating from 510–500 BC, that shows a boy crouched on a rock with a fishing-rod in his right hand and a basket in his left. In the water below, a rounded object of the same material with an opening on the top. This has been identified as a fish-cage used for keeping live fish, or as a fish-trap. It is clearly not a net. This object is currently in the Museum of Fine Arts, Boston. There are numerous references to fishing in ancient literature; in most cases, however, the descriptions of nets and fishing-gear do not go into detail, and the equipment is described in general terms. An early example from the Bible in Job 41:7: Canst thou fill his skin with barbed irons? or his head with fish spears?. 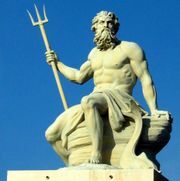 The Greek historian Polybius (ca 203 BC-120 BC), in his Histories, describes hunting for swordfish by using a harpoon with a barbed and detachable head. From ancient representations and literature it is clear that fishing boats were typically small, lacking a mast or sail, and were only used close to the shore. In traditional Chinese history, history begins with three semi-mystical and legendary individuals who taught the Chinese the arts of civilization around 2800–2600 BC: of these Fu Hsi was reputed to be the inventor of writing, hunting, trapping, and fishing. It is possible to fish with minimal equipment by using only the hands. In the USA catching catfish in this way is known as noodling. In the British Isles, the practice of catching trout by hand is known as trout tickling; it is an art mentioned several times in the plays of Shakespeare. Catching fish by hand is currently illegal in the United States in the state of Kansas. Head of an arrow used for fishing, from Guyana. Fishing with a cast net. Coracles on the River Teifi, Wales 1972. A Moroccan fisherman mending his nets. A small hand net held open by a hoop and possibly on the end of a long stiff handle has been known since antiquity and may be used for sweeping up fish near the water surface. Such a net used by an angler to aid in landing a captured fish is known as a landing net. In England, hand netting is the only legal way of catching eels and has been practised for thousands of years on the River Parrett and River Severn. A casting net is circular with a weighted periphery. Sizes vary up to about 4 m diameter. The net is thrown by hand in such a manner that it spreads out on the water and sinks. Fish are caught as the net is hauled back in. 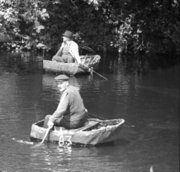 Coracle-fishing is performed by two men, each seated in his coracle and with one hand holding the net while, with the other, he plies his paddle. When a fish is caught, each hauls up his end of the net until the two coracles are brought to touch and the fish is then secured. The Chinese fishing nets (Cheena vala) found at Kochi in India are an example of shore operated lift nets. Huge mechanical contrivances hold out horizontal nets of 20 m or more across. The nets are dipped into the water and raised again, but otherwise cannot be moved. A seine is a large fishing net that may be arranged in a number of different ways. In purse seine fishing the net hangs vertically in the water by attaching weights along the bottom edge and floats along the top. A simple and commonly used fishing technique is beach seining, where the seine net is operated from the shore. Danish seine is a method which has some similarities with trawling. Trawling is a method of fishing that involves actively pulling a fishing net through the water behind one or more boats. A gillnet catches fish which try to pass through it by snagging on the gill covers. Thus trapped, the fish can neither advance through the net nor retreat. Ghost nets are nets that have been lost at sea. They may continue to be a menace to wildlife for many years. There are types of dredges used for collecting scallops or oysters from the seabed. They tend to have the form of a scoop made of chain mesh and they are towed by a fishing boat. Scallop dredging is very destructive to the seabed, and nowadays is often replaced by mariculture or by scuba diving to collect the scallops. Fish are caught with a fishing line by encouraging a fish to bite upon a fish hook or a gorge. A fishing hook will pierce the mouthparts of a fish and may be barbed to make escape less likely. A gorge is buried in the bait such that it would be swallowed end first. The tightening of the line would fix it cross-wise in the quarry's stomach or gullet and so the capture would be assured. Trolling is a technique in which a fishing lure on a line is drawn through the water. Trolling from a moving boat is a technique of big-game fishing and is used when fishing from boats to catch large open-water species such as tuna and marlin. Trolling is also a freshwater angling technique most often used to catch trout. Trolling is also an effective way to catch northern pike in the great lakes. This technique allows anglers to cover a large body of water in a short time. Snagging is a technique where the object is to hook the fish in the body. Generally, a large treble hook with a heavy sinker is cast into a river containing a large amount of fish, such as a Salmon, and is quickly jerked and reeled in. Due to the often illegal nature of this method some practitioners have added methods to disguise the practice, such as adding bait or reducing the jerking motion. Modern kitefishing is popular in New Zealand, where large delta kites of synthetic materials are used to fish from beaches , taking a line and hooks far out past the breakers. Kite fishing is also emerging in Melbourne where sled kites are becoming popular, both off beaches and off boats and in freshwater areas. link title The disabled community are increasingly using the kites for fishing as they allow mobility impaired people to cast the bait further out than they would otherwise be able to. Fishing method of Wagenya people in Congo. A technique called dam fishing is used by the Baka pygmies. This involves the construction of a temporary dam resulting in a drop in the water levels downstream — allowing fish to be easily collected. Basket weir fish traps were widely used in ancient times. They are shown in medieval illustrations and surviving examples have been found. Basket weirs are about 2 m long and comprise two wicker cones, one inside the other — easy to get into and hard to get out. Pot traps are typically used to catch crustaceans such as crabs, lobsters and crayfish. Pot traps such as the lobster trap may be constructed in various shapes, each is a mesh box designed with a convoluted entrance that makes entry much easier than exit. The pots are baited and lowered into the water and checked daily. Similar traps are used in many areas to capture bait fish. Chinese man with fishing cormorant. 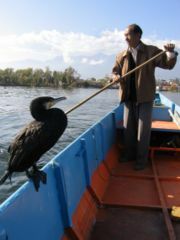 In China and Japan, the practice of cormorant fishing is thought to date back some 1300 years. Fishermen use the natural fish-hunting instincts of the cormorants to catch fish, but a metal ring placed round the bird's neck prevents large, valuable fish being swallowed. The fish are instead collected by the fisherman. A low voltage or short pulse with long gaps will cause the fish to swim away from the device, and high voltage or long pulses with short rests can cause galvanonarcosis, or unconsciousness. Techniques for setting pulse length and patterns, current and voltage require great skill to fish effectively without killing or injuring fish if they are to be left unharmed. Dissolved minerals in the water can decrease resistance causing less of the current to pass through the fish, whereas fish recently entering fresh water from the ocean have high salinity and are more prone to electric shock. Also the smaller the fish, and consequently the less surface area in contact with the water, the higher the current required to produce galvanotaxis. Smaller fish also require shorter pulses, closer together, while large fish should have longer pulses at lower power and longer gaps between pulses. Electro-fishing is also used to illegally catch Razorfish or Spoots, using a boat based generator. Current is passed into the sediment causing the Razorfish to 'jump' and be harvested by divers. For obvious reasons this method of electro-fishing is banned due to the risk to the divers. Recreational fishing and the closely related (nearly synonymous) sport fishing describe fishing for pleasure or competition. Recreational fishing has conventions, rules, licensing restrictions and laws that limit the way in which fish may be caught, The International Game Fishing Association ( IGFA) makes and oversees these obligations. Typically, these prohibit the use of nets and the catching of fish with hooks not in the mouth. The most common form of recreational fishing is done with a rod, line and hooks attached to any of a wide range of lures or baits. Most types of fishing tackle are made in a professional manufacturing facility and other for hobbyist enjoy making their own baits, examples would include the use of Fishing worm molds, etc. This practice is known as angling. One method of growing popularity is kayak fishing. Kayak fisherman fish from sea kayaks in an attempt to level the playing field with fish and to further challenge their abilities. Kayaks are extremely stealthy and can allow anglers to reach areas unfishable from land or by conventional boat. In angling, it is sometimes expected or required that fish all be returned to the water ( catch and release). The practice, however, is viewed by some with disapproval as they consider it unethical to inflict pain on a fish for fun or sport and not for reasons of capturing food. Anglers deny this charge, pointing out that fish commonly feed on hard and spiky prey items, and as such can be expected to have tough mouths, and also that some fish will re-take a lure they have just been hooked on, a behaviour that is unlikely if being hooked were painful. There is also some research that shows certain types of fish such as catfish, do not have nerves around their mouth. They most likely do not have nerves in their mouths due to the fact that they eat animals such as crawfish that can pinch. In a real sense, the suitability of catch and release is an ethical consideration and, as such, a science-based conclusion on the issue is unavailable. Scientific studies show a wide range of survival, depending on species, environmental conditions, fish density and research design (methodology). The difficulty of doing such experiments is closely linked to the fact that negative effects of being exposed to fishing gears develop over a long time. Keeping fish trapped over a long period of time creates a lot of noise which makes it hard to single out the effect of the catch from the effect of the chosen methodology. Nevertheless, several studies have now returned very high survival rates (95%+) for species caught on fly and lures, which generally tend to hook fish in the mouth and thus aid catch and release fishing. Proponents of catch and release also contend that the practice is increasingly necessary in order to conserve fish stocks in the face of burgeoning human populations, mounting fishing pressure and worsening habitat degradation. Opponents would prefer to ban or to severely restricting angling, a suggestion most anglers find unpalatable. Recreational fishermen can have profound deleterious effects on fish stocks in commercial lakes, this is due to anglers with poor knowledge of how to protect the fish from damage or stress once out of the water. The fish which suffer most are those of large, slow growing species such as carp. The only way for growing numbers of recreational fishermen to continue fishing is to reduce their impact on fish populations or to increase the fish populations (e.g. by restocking). Catch and release, in combination with techniques such as strong tackle (to get fish in quickly, for release in good condition), careful handling of fish and barbless hooks (to reduce physical damage) and quick release lead systems such as the Korda quick release system or the E.S.P. variety may be useful tools in this endeavour. Barbless hooks reduce damage to minimal levels, reduce de-hooking time and greatly aid in catch and release. Many keen catch and release anglers use barbless hooks. Barbless hooks can be purchased, or created by crushing the barbs on a normal hook flat with a pair of needle-nosed pliers. It is popularly believed barbless hooks lead to more lost fish, but ensuring lures are equipped with split rings and keeping the line tight while fighting fish will reduce fish losses to levels similar to those of barbed hooks. Also using circle hooks will cause the least amount of damage to a fish. The design of the hook is very simple, it is like a circle. When a fish bites the bait the hook's design causes it to hook in the side of the fish's mouth every time. This makes it very easy to remove the hook with minimal damage. Setting your hook when a fish bites is also different. Instead of snatching your line you slowly set your hook. This alone is a lot less stressful on the fish. A circle hook is the best choice for catch and release programs. A recent phenomenon of recreational fishing are fishing competitions (tournaments) where fishermen compete for prizes based on the total weight of a given species of fish caught within a predetermined time. This sport evolved from local fishing contests into large competitive circuits, especially in North America. Competitors are most often professional fishermen who are supported by commercial endorsements. Other competitions is purely on length with mandatory catch and release, either longest fish or total length is documented with camera and a mandatory sticker, is more fair since it’s hard to weigh a living fish accurately in a boat. Big-game fishing describes fishing from boats to catch large open-water species such as tuna, sharks and marlin. Noodling and Trout tickling may be pursued as a recreation. Laws made to control recreational fishing frequently also attempt to control the harvest of other aquatic species, such as frogs and turtles. A trawler leaving the port of Ullapool, north-west Scotland. Commercial fishing provides a large quantity of food to many countries around the world, but those who practice it as an industry must often pursue fish far into the ocean under adverse conditions. Commercial fishermen harvest almost all aquatic species, from tuna, cod and salmon to shrimp, krill, lobster, clams, squid and crab, in various fisheries for these species. Commercial fishing methods have become very efficient using large nets and sea-going processing factories. Many new restrictions are often integrated with varieties of fishing allocation schemes (such as individual fishing quotas), and international treaties that have sought to limit the fishing effort and, sometimes, capture efficiency. Commercial fishing gears today are surrounding nets (e.g. purse seine), seine nets (e.g. beach seine), trawls (e.g. bottom trawl), dredges, hooks and lines (e.g. long line and handline), lift nets, gillnets, entangling nets and traps. In addition to the above, commercial fishing can also be thought of as encompassing "pay to fish" enterprises, which provide anglers with controlled access to stocked lakes, ponds or canals. These provide fishing opportunities outside of the permitted seasons and quotas applied to public waters. In the United Kingdom, commercial fisheries of this sort charge access fees, with prices ranging from £2 to £25 per day. In North America, establishments usually charge for the fish caught, by length or by weight, rather than for access to the site although some establishments charge both types of fees. Prices for fish caught in North American "pay to fish" waters are generally in the range of $0.10 to $0.20 per cm or from $5.00 to $10.00 per kg. A fish-drying rack. Hovden in Norway. Salting of fish in factory. Ancient methods of preserving fish included drying, salting, pickling and smoking. All of these techniques are still used today but the more modern techniques of freezing and canning have taken on a large importance. Haddock: Arbroath Smokie (lightly smoked). Herring: kipper (salted and smoked), surströmming (fermented), rollmops (pickled), soused (salted). Salmon: smoked salmon, cured salmon, and gravlax (fermented). Cod: stockfish (air dried), lutefisk (soaked in lye). 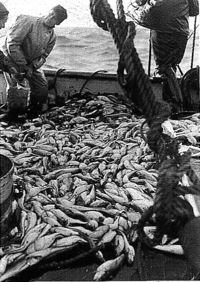 In the past, fishing vessels were restricted in range by the simple consideration that the catch must be returned to port before it spoils and becomes worthless. The development of refrigeration and freezing technologies transformed the commercial fishing industry: fishing vessels could be larger, spending more time away from port and therefore accessing fish stocks at a much greater distance. Refrigeration and freezing also allow the catch to be distributed to markets further inland, reaching customers who previously would have had access only to dried or salted sea fish. Canning, developed during the 19th century has also had a significant impact on fishing by allowing seasonal catches of fish that are possibly far from large centres of population to be exploited. For example: sardines. Fried fish & French fries (fish & chips). The flesh of many fish are primarily valued as a source of food; there are many edible species of fish as well as other sea food. Shellfish include shelled molluscs and crustaceans used as food. Shelled molluscs include the clam, mussel, oyster, winkle and scallop; some crustaceans are the shrimp, lobster, crayfish, and crab. Eggs, called roe, of various species may be eaten; roe comes from fish and certain marine invertebrates, such as sea urchins and shrimp. In some cultures, roe is considered a delicacy, for example caviar from the sturgeon. Squid and octopus are valued as food. Sea cucumber is considered a delicacy in Chinese cooking and is often served at New Year’s feasts, usually in soups. In some cultures, for example China, Japan, and Vietnam, certain species of jellyfish are consumed. Fish oil is valued as a dietary supplement. Live fish are collected for the international live food fish trade. Some seafood restaurants keep live fish in aquaria for display or for cultural beliefs. The majority of live fish kept at seafood restaurants, however, are desired for the freshness of the seafood, being killed only immediately before being cooked. Suiting customer preference, this practice makes the seafood higher in quality and better in taste. The prevalence of cultural beliefs and consumer standards helps to drive the demand for the live food fish trade. Hong Kong, for example, is estimated to have imported in excess of 15,000 tonnes of live food fish in 2000. This brought the value of their live food fish trade industry to US$400 million as reported by the World Resources Institute. Fish can also be collected in ways that do not injure them such as in a seine net or by placing an electric current into the water. Such techniques are used most often by researchers for observation and study but are also used by those who collect fish for the aquarium trade. There are several organizations devoted to improving the methods of collecting, handling, transporting, exporting and farming of wild and domesticated live food fish, as well as freshwater and marine tropical fish destined for aquaria. Pearls and mother-of-pearl are valued for their lustre. Traditional methods of pearl hunting are now virtually extinct. Sharkskin and rayskin which are covered with, in effect, tiny teeth (dermal denticles) were used for the purposes that sandpaper currently is. These skins are also used to make leather. Sharkskin leather is used in the manufacture of hilts of traditional Japanese swords. Tyrian purple is a pigment made from marine snails Murex brandaris and Murex trunculus. Sepia is a pigment made from the inky secretions of cuttlefish.